It’s time to start humming the Henty Field Day song. 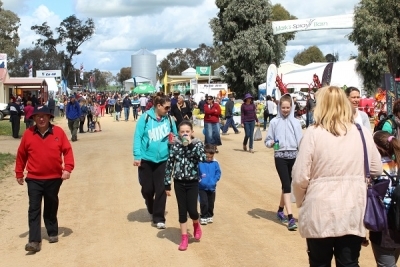 Henty is a wonderful celebration of the Australian Agriculture and Farming industry, where innovation and inspiration is on display. The famous tune, immediately brings a couple of important health reminders to mind, ensuring you have a great visit. Wear comfortable shoes, as you are guaranteed to walk many kilometres, with 105ha to explore and 1200 sites for 850 stall holders. Take a carry bag, back pack or trolley if you are anticipating buying lots of goodies. This will reduce your risk of a neck, shoulder or back injury as you haul heavy bags around with you. You can also take advantage of the 2 free shuttle buses stopping at eight designated points around the site. Drink plenty of water and wear a hat as you are walking out in the open and despite cooler weather you still need to keep your fluid intake up. Watch your step: use a walking pole if you are not as sure on your feet. While the pathways are quite flat, we are still in a paddock, and there are some uneven surfaces. If you are one of the wonderful volunteers, please ensure optimal manual handling techniques when carrying boxes of goodies and food. This year there is an Agri- Innovators site which is always an exciting topic for a physio whose interest is to help find ways to reduce load and fatigue by improving manual handling and efficiency, particularly in the area of single person farming. Back up Charlie, a flexible sheep movement system “designed to reduce operator fatigue and increase labor efficiency”, Designed in Urana, the system applies a “hands off” approach for pushing sheep up a race, preventing them from moving back in the race, saving precious backs, knees and time! Another great idea is the Fencing trailer, custom built to minimize the amount of time spent loading and unloading fencing material onto a tray back ute using a forklift or tractor forks. Fencing is a never ending task on the land, so this could improve your efficiency by having all of your material at the ready and reducing the load/unloading manual handling risks. Separating and Pushing feed off the back of the Ute is a time consuming and physically demanding task requiring 2 people to complete. A simple idea prompted when using an exercise treadmill was the stimulus for the remote controlled conveyor belt feeder, designed to fit on the back of a ute. Capable of handling large square bales and silage bales, this simple innovation has also been adapted for spreading sand, gravel, garden waste and mulch without the need for a hoist. The sheep producer, turned innovator form the Riverina said it was a “simple occupational health and safety solution for work around the farm”. A physios dream! Don’t forget the other reason for Henty is for people to gather together to discuss the ever present issues, ensuring we support each other. Droving the Blues Away will raise money for the mental health organization Riverina Blue Bell. The goal of the fundraiser is to raise awareness about the avenues of support for mental health available to local communities. See you at the Henty Field Day….. Nothing like it Anywhere!